It was more than 20 years ago when I learned I have slight scoliosis. My mother bought me a special quilted mattress to make my sleep comfortable. I must say the new bed helped. It conformed to my spine’s natural curve and distributed the pressure evenly across my body. When I married and started building our space, I requested my husband to buy us a comfortable bed. As always, I aim for a relaxed sleep after long hours of hard work. We all deserve it anyway. Sleep plays a vital role in keeping one healthy. It recharges and gives us the energy to face daily responsibilities. Some find difficulty falling into a deep slumber because of the lack of comfort their mattress provides. Thus again, I believe we deserve to invest in a good mattress. I recently got acquainted with Sealy Posturepedic mattress, and I must say, it exceeded the comfort my bed brings me. Sealy Posturepedic is an American mattress brand that has more than 130 years of premium spring mattress-making history. Now available in the Philippine through Focus Global Inc., this bed is known for its PostureTech® Titanium Coil, a patented technology that provides superior comfort, support, and correct spinal alignment developed with the aid of Orthopaedic Advisory Board (OB). OB is a panel of esteemed orthopedic surgeons, clinicians, and sleep experts. Besides the product’s trademark titanium coil technology, Sealy also consists of several product features to ensure a good night’s sleep. Full surround edge support that locks into the spring system to provide a stable sleep surface, ultimate stability, and minimize motion transfer for an undisturbed night’s sleep. LiftRight Handle found on each corner and side of the mattress for additional gripping points to make moving the bed easier. Torsion Bar is a support module that absorbs the shocks a bed experiences every day. Stay Tight Foundation Cover has intelligent rubberized fabric that grips your sheets, for a tidier looking bed. Silver Ion Fabric has a unique antibacterial and moisture-removing properties that prevent bacterial growth and promote natural hygiene. What perhaps impressed me the most is that Sealy coils are light and durable. The coils are strengthened as well to retain their resiliency over time. This makes it a real good investment. I need not buy a new mattress just because it started to sag after several years. 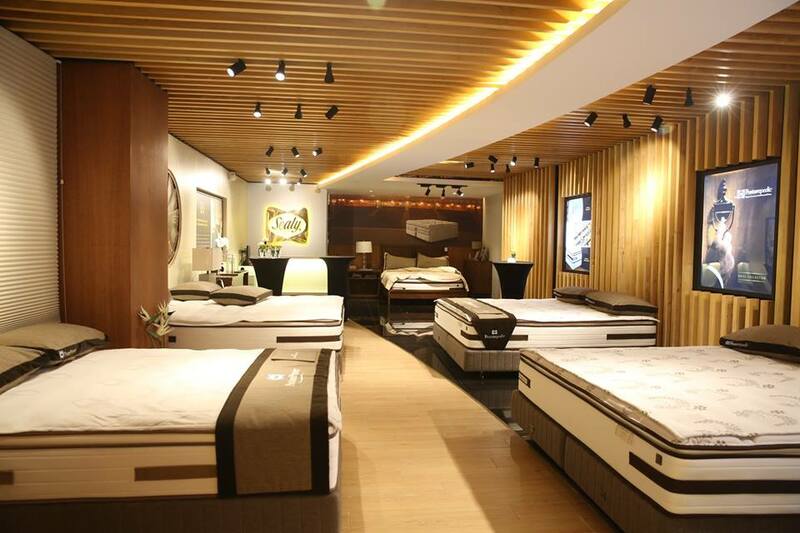 Located at the Shangri-La Plaza Mall, Sealy Sleep Boutique carries Sealy’s Premier, Advance and Prestige collections. Also, it offers custom-sized beds. Further readings led me to discover that Sealy is the largest bedding manufacturer in the world. It is also the preferred mattress brand of the top international hotel chains such as Fairmount, Four Seasons, Hilton, Marina Bay Sands and Ritz Carlton. This perhaps is enough reason why Sealy truly gives a good night’s sleep. These hotels only choose quality brands to maintain their good standing and reputation. So in need of bed? Check out Sealy mattress today. Treat yourself to a night of great sleep and relaxation. You deserve it. 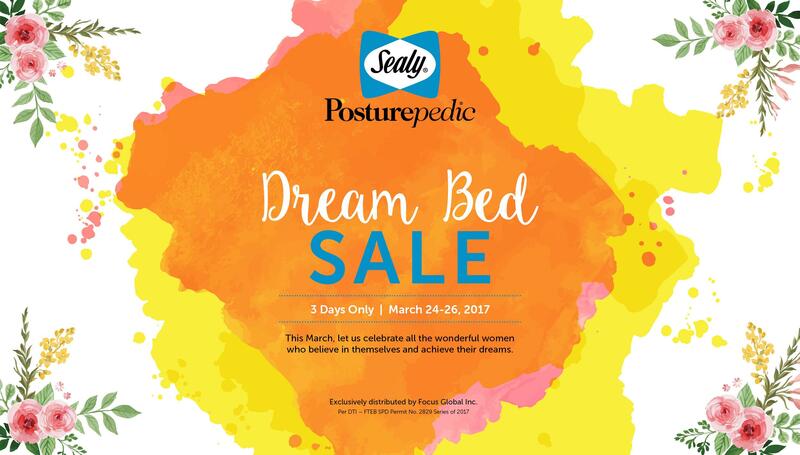 Your dream bed on sale from March 24-26, 2017 only. Open Monday-Thursday 11 am to 9 pm, Friday-Sunday 11 am to 10 pm Level 5, Main Wing, Shangri-La Plaza. Too bad that I was not able to share this with my aunt. She has been looking for a bed like this and even telling me she’ll buy me one. This is still in my wish list! But, I think this could cost a lot because they offer more when it terms to health. Sometimes we really need to invest for comfort and health. And I find investing in a nice mattress as a sound and good decision. Yes, when it could to health and comfort, I always encourage my boys to invest in a real good piece. I would love to get a good night’s sleep. It’s probably time to get a new mattress. Always go with Uratex but want to consider others. Sealy seems like a good option.